Combine buttermilk, egg, oil & vanilla in a measuring cup. Add buttermilk mixture to flour mixture, fold until just combined. Bake for 10-12 minutes until tops spring back. Remove from pan to cooling rack set over wax paper. In a small bowl, place powdered sugar & vanilla. Add milk gradually, stirring until you get a smooth glaze the consistency of maple syrup. 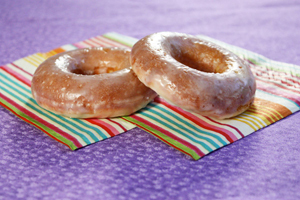 Dip doughnuts into glaze while warm to coat all sides. Eat warm or cool on a rack. 47 Comments on "Baked Doughnuts"
I’m not sure why they would be dry. If you can send a complete list of all your ingredients (brand names included) as well as the brand of pan and how long you preheated your oven, I will try to help. all ingredients store brand. ( i live pay check to paycheck. Assuming you used buttermilk, there are two things that come to mind. 1) Silicone pans don’t conduct heat very well. I bought some myself and never used them a second time. 2) Toaster ovens may not have enough circulation for successful baking. If you have the chance to try the recipe once in your oven and with a metal pan, I think you will see a big difference. If not, you could look for online tips for baking in a toaster oven. I hope this helps. can you double the recipe thank you can’t wait to make them. Jenny, thanks for the recipe. I will make these soon as I find the doughnut pan. Made the Baked Donuts today. So good. Just had one with a cup of coffee. DELICIOUS! Thanks, Jenny. I’m trying your meatloaf tomorrow. I’m going to post a picture. I was wondering if I could put butter in these because I am addicted to butter and donuts. Also is there gluten in these? I have been gluten free for 4947 days and it is killing me, please do not tell my mom, it will be hard because I still live in her basement at 49. Also, I need a good substitute for butter milk. The internet said to mix milk and lemon juice, but wouldn’t that just make lemon milk? I looked these people up and they looked stupid who would want to make cookies when you could buy them. So I just mixed butter and milk and the doughnuts turned out great if you like gross doughnuts, which I happen to love. I would say thanks but I think I should just stick with PLEASE HELP. All wheat flour contains gluten. For a buttermilk sub, please see “Substitutions” in my blog. I have not made these yet, but I use Kefir in place of buttermilk in pancakes, pound cake, etc… They come out fluffy, soft and moist. Hi Jenny, just made these and they turned out great. Can I substitute honey or maple syrop for part or all the sugar? Hi Jenny: I just made the donuts, and I can’t believe that a half cup of flour made six donuts. They weren’t huge, but they came out just fine. I did cheat and melted a T. of butter instead of using a T. of canola oil. I made creamed filled donuts the other day, and fried them in Canola oil. The oil has a terrible taste and of course the donuts did too. When I smell the oil in the bottle, there is no smell to it. Have you noticed that it doesn’t heat up well? I did notice that my baked donuts, today, weren’t very light. My fault? Ann’s comment to you was right on. Thanks for being you. Changing a recipe, even a little change, can cause problems so I suggest using my doughnut recipe exactly as written. Jenny, I woke up early to make these yummy doughnuts! Soooo light and tender. From now on, I can have my doughnuts and eating them too! 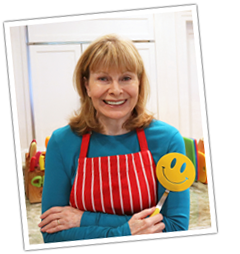 Thank you for the effort you put into sharing the recipes with the world! You know what, as much as you love baking and cooking, I’m sure you can utilize your time doing other things too but instead, you choose to share your precious time with a very appreciative group of people with your blogs! Thank you! I don’t have any thanks. This is addressed at the bottom of the recipe. I’m sorry I have no knowledge on this. You may be able to find some information with an internet search. Did you find the alternative to egg? I’m also looking for an eggless donut recipe! Please let me know if u find any! Thanks so much. Hi wanted to know if I could use whole wheat pastry flour…. Jenny these look so yummy! Is there any other way to bake them besides a donut pan? Hi Jenny, I couldn’t find your recipe of Pączki -Polish Jelly Donuts – Oven-Baked Doughnuts. It looks good and easy enough to make. Hi jenny these look great ! I’m definitely try this recipe!! !but hard to fined butter milk here in japan ! It’s ok I’m using frest cream!!thanks!! Cream is not a good substitute for buttermilk in baking. Buttermilk provides the acid needed to make the doughnuts light and fluffy. A better substitute would be either yogurt or sour cream combined with some milk to achieve a pourable consistency. Both yogurt and sour cream are acidic in nature. If you only have cream, at the very least add about 2 tsp. lemon juice or vinegar to it and let it stand for 5 minutes before using. Please Jenny can you tell me the measurement of the flour in grammes . The cup is confusing. There is a metric conversion chart in my blog. The spice is ground nutmeg and the doughnuts will turn out fine without it. I just like the little hint of flavor it gives them. Why can’t we use milk instead of buttermilk? Will the end result be alot different? You will not get the same result by using milk. The acid in buttermilk is needed to create a puffy, airy, doughnut as well as a better taste. The good news is you can freeze buttermilk and use it later for baking. If you like these donuts (and you will!) you could freeze 1/4 cup portions and have them on hand for your next batch. It will separate but you just thaw your buttermilk overnight in the fridge and stir it up vigorously… then make more donuts. I hope that helps. Hi, Jenny just tried your baked doughnuts, for the second time. Yesterday it was a disaster, but today they so good and tasty that my wife asked me do bake some more. Thank you. I shall try more of your receipes. These look great!! I’m definitely going to try these! Thank you! !